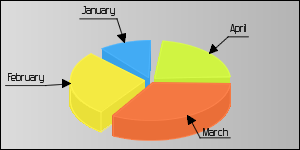 pChart can render both 2D and 3D pie charts. Data are provided through the pData class with some limitation because only one data serie may be rendered on this kind of charts. Only the 1st data serie that is marked as Drawable will be used. An abscissa serie must be set, it will be used for labelling the data.